EUROPEAN FEDERALIST PARTY » PRESS RELEASE: the EU’s first “coup d’état” is in the making! – Respect our vote! 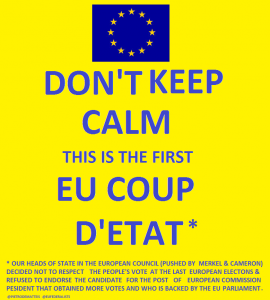 PRESS RELEASE: the EU’s first “coup d’état” is in the making! – Respect our vote! The European Federalist Party strongly condemns the decision taken by the heads of states and government within the European Council not to endorse the European Commission President-elect following last week’s European Parliament’s elections. This can be considered the EU’s first coup d’état operated by the European Council against the European Parliament and the European citizens! “They told us that these European Elections were different” argued Pietro De Matteis, co-President of the European Federalist Party. “We watched the Eurovision political debate, candidates campaigned across Europe and now Angela Merkel and David Cameron want to disregard all this? This is not acceptable!” he added. WE URGE the European Parliament to stand united and to defend the choice made by the European people despite their political differences. Democracy in Europe is more important! Should it fail, this would be a major setback in the process of democratisation of the EU. WE STRONGLY DEMAND our heads of states and government in the European Council to be ambitious and wise enough to accept the nomination for the post of European Commission President put forward by the European Parliament. A less legitimate and democratic EU will reinforce nationalist movements and weaken further the trust in the process of European integration. CONTACTS: The contact person for this press release is Maria Coelho maria.coelho@federalistparty.eu. and by phone to +32 485 291 863. The co-president of the European Federalist Party Pietro De Matteis can be contacted by writing to: pietro.dematteis@federalistparty.eu. WHO WE ARE: The European Federalist Party (EFP) is the pan-European party for a more democratic, united and solidary Europe: a Europe of the people and for the people. The EFP was founded in 2011 in Paris by citizens from all over Europe and has since developed into a cross-border movement with thousands of members, supporters and chapters in 18 EU states. The EFP was instrumental in the introduction of several key laws and reforms in the EU, including improvements to the Lisbon treaty, the European Citizens’ Initiative and the EU roaming regulation. It took part in the 2014 European Elections in 6 countries. More information are available on our website www.federalistparty.eu and on Facebook: www.facebook.com/EuropeanFederalistParty.